Hezbollah’s missiles have built, since 1990, a new meaning in the concept of deterrence upon affecting both the decision makers in the Zionist entity and the Israeli public opinion. In parallel, Hezbollah Secretary General, Sayyed Hasan Nasrallah’s speeches have rolled, touching the consciousness of the Israeli “home front command”, in a clear indication that Hezbollah, and its leadership, knows well their influence ability. During a quarter of century, concepts of Hezbollah’s influence have been gradually strengthened in the Israeli consciousness. Last week, the Israeli public opinion eagerly awaited the interview with Sayyed Nasrallah on Al-Mayadeen. 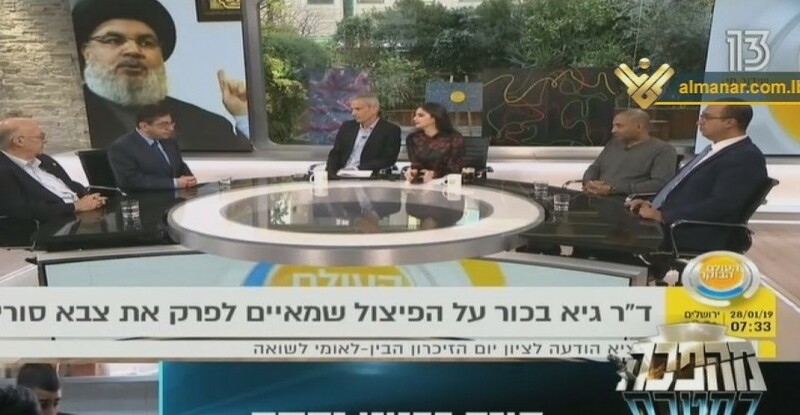 The Israeli street seemed not interested in neither Netanyahu’s comments nor the silly statements of the Israeli army’s speaker, Avichay Adraee, commenting on Sayyed Nasrallah’s interview. According to the Israeli public opinion, Adraee is trying to turn the Lebanese street and especially the Shiite one against Hezbollah, rather than enhancing the Israeli morale. In his last interview (January 26, 2019), Sayyed Nasrallah said that the Israeli settlers have been in fear of Hezbollah’s tunnels to the extent that if they hear a sound of a hammer they will call the occupation military for help. The settlers’ fear has been created many years ago, even before Sayyed Nasrallah’s “hammer” tale which went viral on social media. Moving toward the issue of cement wall that Zionists are building on the Lebanese border with the occupied territories, Israeli settlers ask about its utility in the face of Hezbollah’s missiles that are capable of reaching the Israeli depth. “What is the point behind building a wall that only suits the climbing maneuvers of the Israeli military? Hezbollah’s danger is within its missiles that will not keep for us any safe place to go for in a war,” one Israeli settler said after watching Sayyed Nasrallah’s interview, according to Israeli media. By the astonishment drawn on the Zionist commentators’ faces due to peace and serenity of Sayed Nasrallah during Al-Mayadeen interview and the logical justifications his eminence had offered on his media absence throughout the past period, the Israeli analysts personally responded to Adraee, who tried to exploit Sayyed Nasrallah’s silence in a bid to overcome the Israeli frustration. From 1996 to 2019, a new generation in the Zionist army has born. A generation that grew on distrust in its government and army, especially after the Israeli withdrawal from Lebanon in 2000, and the victory achieved against the Israeli enemy in July 2006. This generation has only witnessed the era of defeats, unlike the generations that preceded it, which lived Israel’s arrogance on Arab. A relation of influence has been built between the new Israeli generation and Sayyed Nasrallah, who has managed to set new equations with the Israeli enemy. Hence, this generation of Israeli settlers became a prisoner of Sayyed Nasrallah’s “charisma”.